The Ryobi 120-Piece Drilling and Driving Bit kit offers the ultimate variety of drilling and driving bits to cover a wide range of applications. The drill bits are great for drilling into wood, metal, and plastic. This kit includes an assortment of Philips, slotted, hex, torn and square bits. The included compact screw guide ensures a secure hold on all bits. For use with any 1/4-inch impact driver, the DeWalt DW0521 3/8-inch Keyless Chuck allows you to effortlessly lock and lock and release bits to help keep you on task on the job. Built with all-metal construction for maximum durability, it features a single-sleeve design that allows for single handed tightening. To install chuck, just slide the collar back from the front of the tool, twist to attach to any 1/4-inch impact driver, and release the collar. The chuck is locked in place. 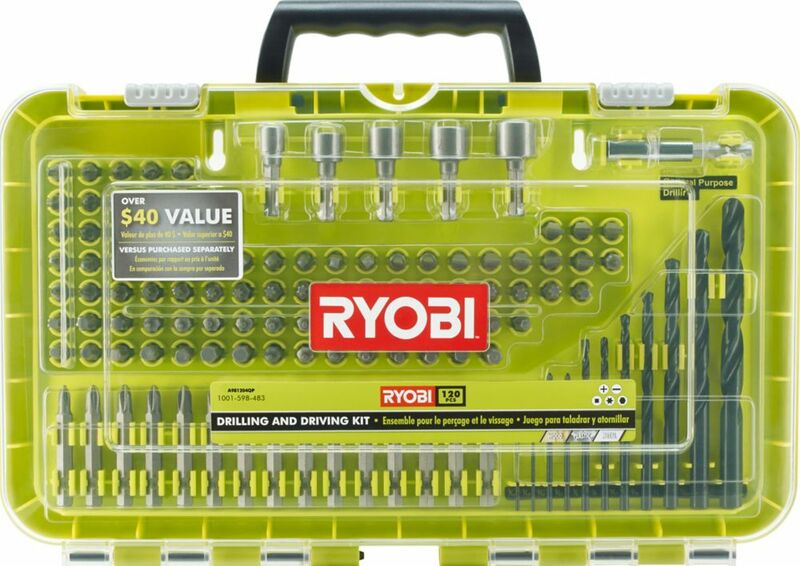 Drill and Drive Kit (120-Piece) The Ryobi 120-Piece Drilling and Driving Bit kit offers the ultimate variety of drilling and driving bits to cover a wide range of applications. The drill bits are great for drilling into wood, metal, and plastic. This kit includes an assortment of Philips, slotted, hex, torn and square bits. The included compact screw guide ensures a secure hold on all bits. Drill and Drive Kit (120-Piece) is rated 4.8 out of 5 by 69. Rated 5 out of 5 by Madison from Has all the necessary pieces at a cheap price cant... Has all the necessary pieces at a cheap price cant ask for anything more.